Pet Policy: Pets Permitted with a restriction on size and number. Maintenance Fees: Hydro, water, heat, central air conditioning, common elements, basic cable, building insurance & parking. Inclusions: Fridge, stove, built-in dishwasher, washer, dryer, window coverings, electric light fixtures. Upgraded Polo Club I Condo! Sunny, south-west facing suite with unobstructed views from the 19th floor of the beautiful U of T campus, Queens Park and even the lake! This comfortable & recently improved 1 bedroom plus den layoutfeels much larger than it is. Ownership of 1 underground parking spot and large locker! Rental bike locker available. Building maintenance fees are virtually all-inclusive and allow for care free living and easy budgeting. Extremely well run building, highly secure with professional property management including excellent on-site 24 hour concierge. Live in one of downtown Toronto's hottest neighbourhoods! With a Walk & Transit Score of 99/100 getting around the city could not get any easier! The Bay Street Corridor has evolved into one of Toronto's prime condo markets attracting many young professionals and investors thanks to the close proximity of the University of Toronto, all the hospitals and financial district. Enjoy the convenience of being so close to the Bloor-Yorkville and Yonge Street shopping districts adding a lot of jump and vitality to this amazing location. Marble floors in the front foyer and large mirrored double coat closet. Quality wood laminate floors & underpad (2014) in the living room, dining room and den. Open concept layout of the living/dining room withbuilt-in shelving, plenty of space for dining table and couches. Convenient pass through from the kitchen. Sliding glass doors open into the den. Great home office -- with space for pull out couch. The floor to ceiling south west facing windows flood the suite with natural light. Bright, white kitchen with mosaic glass tiled backsplash (2014), ample cupboard space and full size built-in dishwasher. Large master bedroom with new Berber carpeting (2014) , double closet and floor to ceiling windows. Stunning view from bed! Renovated 4 piece bath with marble floors and Jacuzzi style soaker tub with jets. The Bay Street Corridor has theadvantage of being located within walking distance of the Financial District, Distillery District, Hospital District, Bloor-Yorkville, Toronto City Hall, Ryerson University, University of Toronto and downtown Yonge Street. Popular with young professionals who desire an urban lifestyle close to their downtown offices and effortless walk to most everyday necessities including quality grocery stores. Easy access to Porter Airlines at Toronto's Island airport. For all your eclectic shopping needs you can walk out to the Downtown-Yonge shopping district or if you prefer upscale the Bloor-Yorkville shopping district features high end international clothing and boutique stores and a variety of both casual and upscale restaurants. On those blustery winter days Bay Street Corridor residents can quickly duck inside to the Atrium on Bay, College Park Shopping Mall, Eaton's Centre and the Manulife Centre . Many of these shopping destinations are connected by Toronto's underground PATH retail concourse. Plenty of parks and green spaces! Walk to the beautiful Queens Park, located off University Avenue just south of the Ontario Legislative Building. The park is heavily treed and serves as a quiet respite with many interesting statues and monuments. The YMCA at 20 Grosvenor Street is a popular place to get in a workout and features a gymnasium and swimming pool. The University of Toronto's Hart House is open to the general public on a membership basis and offers a variety of athletics, arts, live theatre and cooking classes. Go green -- No car needed here with a walk & rider score of 99/100 the world is your oyster to discover on foot! The Bay subway station on the Bloor-Danforth line and the College, Wellesley, Museum and Queen's Park subway stations on the Yonge-University-Spadina subway line are all within 5 minutes or so walking distance. Streetcar lines also operate along College Street. By car mere minutes to the Gardiner, or DVP for access to Pearson Airport or out of town. The Polo One building is well-managed with many long-term residents. Concierges are friendly, helpful and very security-conscious. Located near the corner of Bay & Wellesley. 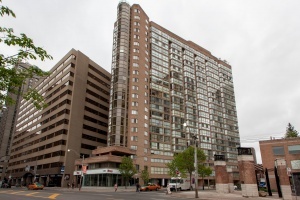 Original & authentic Bay Street condo with direct access to University of Toronto -- St. Michael's campus across the street -- there are some trees and a little doggy park right across the street. Shop for all your grocery needs at Bloor Street Market -- an upscale shop part of the Loblaws chain in Manulife and enjoy Yorkville amenities - all just a short walk away!